Ptosis (droopy eyelids) is a common condition among the elderly, though it can also be a birth defect or a result of an eye injury or disease. In case of inborn ptosis, the eyes appear droopy due to poor development of the eyelid muscles regulating the proper opening of the eyes. Ptosis can affect one eye or both eyes, and is often asymmetrical, meaning, each eye droops differently. Ptosis isn’t just giving your face a tired appearance. It can come with vision complications, such as astigmatism, obstruction of visual axis, a chin-up head position, and amblyopia (lazy eye). Ptosis develops when the muscles that enable the eyelid to move up and down weaken, resulting in a drooping upper eyelid. This can happen due to aging or injury. Nerve damage can also lead to ptosis, with the most common cause being Horner’s syndrome. Horner’s syndrome is usually associated with an underlying condition such as stroke and other brain injuries. 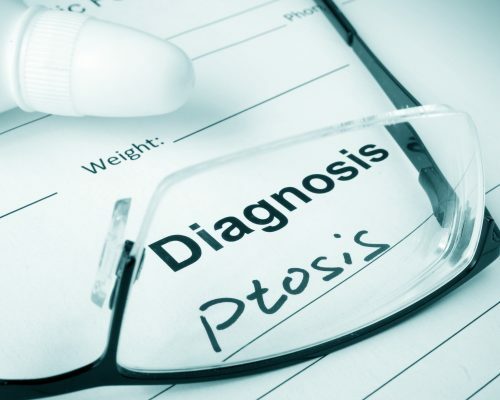 Other chronic conditions can increase a person’s risk of ptosis, too, including diabetes, cluster headaches, and myasthenia gravis (a chronic autoimmune condition marked by abnormal muscle weakness). The primary symptom of ptosis is a visible droopiness of one eye or both eyes. Other symptoms include increased tearing, difficulty seeing, as well as frequent eyebrow raising or tilting the head back in order to see better. Although the visual appearance of droopy eyes is the first step in ptosis diagnosis, regular eye exams are also important to check whether droopy eyelids are impairing one’s vision. Blood tests may also be used to check for diabetes or autoimmune diseases that could be causing ptosis. Lastly, with an X-ray, a doctor can detect any structural abnormalities in the eyes that could be contributing to the problem. Treatment options for ptosis vary depending on the cause. For example, if ptosis is brought on by diabetes, you will have to treat and manage diabetes. Other treatment options for ptosis involve addressing any nerve damage, tumors, cancer, or injuries associated with the drooping eyelid. To treat inborn ptosis, a surgery will be required to manually tighten the drooping eyelid muscles.